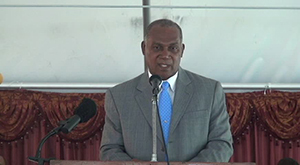 NIA CHARLESTOWN NEVIS (September 15, 2014) –Premier of Nevis Hon. Vance Amory urged one of the long-serving churches on Nevis to hold fast to itsmission and faith, as it celebrated its 50th anniversary at a special service at Whitehall on September 14, 2014. Mr. Amory’s appeal came when he delivered remarks as a guest speaker, at the anniversary celebration of the First Baptist Church at Maddens. “Today in our world we see so many very disturbing incidents occurring. So much strife all over the world especially now in the Middle East and we are aware that that is not purely a political issue, it is a matter of faith where one faith is seeking to overcome, through fear, the western world,” he said. The Premier encouraged the Pastor to ensure that the church retained and continued to teach sound doctrine which could not be condemned. “As you celebrate today, let us ensure that the church retains and teaches sound doctrine, sound doctrine which cannot be condemned because once we stand and my humble opinion is this, we stand on the doctrines and teachings of Christ, the gates of hell can’t prevail and that is fundamental truth. “Fundamental truth sometimes don’t get revealed until history has passed but if we stand in the promise and the instruction of the faith which the baptists believe, then we can be assured that the gates of hell, evil and all of those things which are happening in the world today, with which we are so concerned and so upset, even here I our own little country, we see the anti-social behaviour and I want and I trust and pray that this week pastor and the pastors who will be here, that your witness and your teaching would be a turnaround for our people generally in this country,” he said. Mr. Amory added that Nevis could not afford to lose what it had worked hard for and the church was paramount in moulding its people. “I just want the Baptist Church to remain steadfast and sure in its teaching and hold fast to those things which will edify, which will enable us to grow and become stronger and better societies,” he said.